I was sitting at a coffee shop and my laptop was going quite loud. I opened the Task Manager to check what was eating my CPU. Ok, the virtual machine is going crazy again. 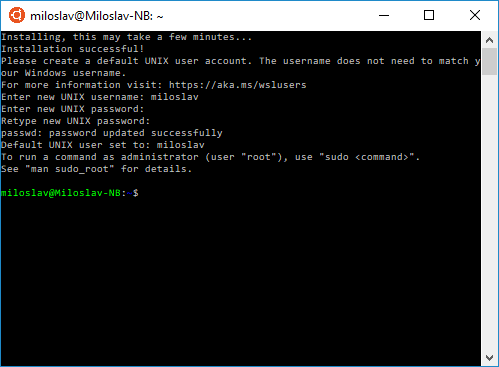 To save up CPU resources and disc space, because I never have too much disc space, I decided to get rid of my Linux virtual machines and use this thing called Windows Subsystem for Linux. It allows to run a Linux environment including most of the Linux applications without the need to actually have a Linux kernel. It just needs Windows 10 which I already had. Since I just need Linux to test some PHP projects and I don't need isolation of virtual machine or possibility to revert, I will be fine with just WSL without an overhead of virtual machine. Now, I will demonstrate how you can set it up. 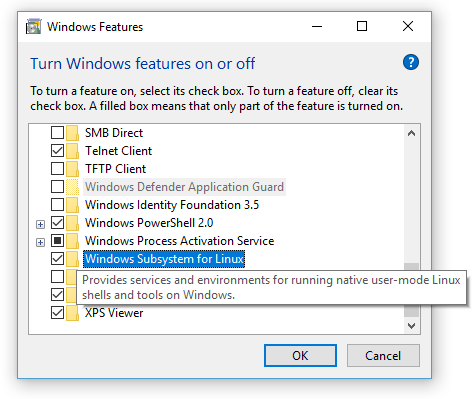 First you will need to install the Windows Subsystem for Linux. Open up Control Panel and turn it on as a feature. Restart your computer, if needed. 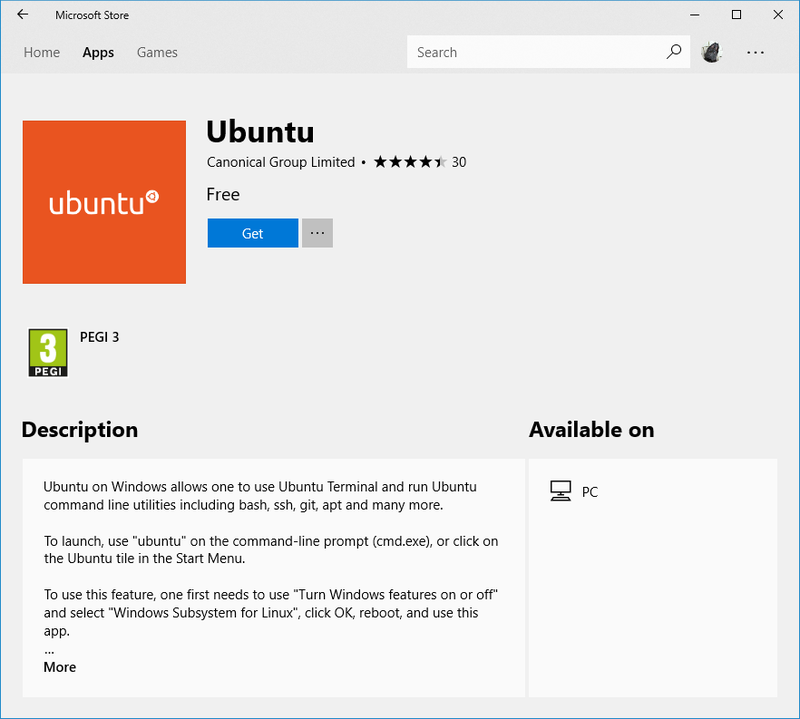 Now go ahead and open Microsoft Store and install Ubuntu. WSL doesn't limit you to just this Linux distribution, so you are free to choose your favorite one. At the time of writing this article, I haven't found Red Hat or Fedora. Click Get. After the installation you should see Ubuntu bash. Once you've installed Ubuntu, you will need to get a web server and PHP. I'm going to install Apache for this article, but feel free to install the web server of your preference. Turn Xdebug on. Open php.ini. 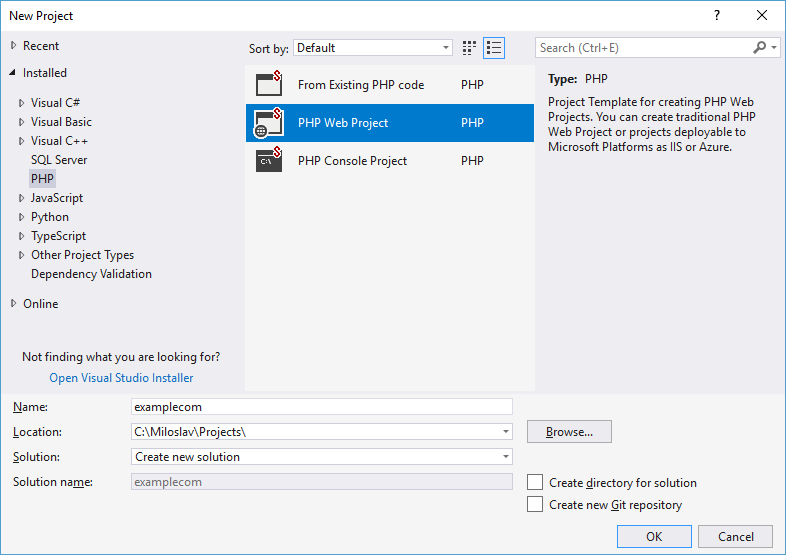 If you happen to have PHP Tools for Visual Studio version 1.27 or higher you can use the New project dialog. Just click File | New | Project, select PHP Web Project. Fill the location and the name. Select Simple CMS Project, just to try out something a little more complex than the "Hello World" script. If you don't have any PHP installation on Windows, PHP Tools will ask you if you'd like to install it, you can just click Yes. Then, you will get asked if you want to download composer packages. Click Yes. Once you have a project, you need to decide how to get it to the Ubuntu. The traditional way would be to publish it (and all the subsequent changes) through FTP/S or share it through Samba. Luckily WSL automatically mounts Windows filesystem so you can access it from Ubuntu. For c drive it's /mnt/c. For developing purposes, you can setup Apache to serve files directly from there. Note: You can also access Linux files from Windows, but use it just as read-only view. Altering files will possibly lead to data corruption. You can find Ubuntu files on this location: %localappdata%\Packages\CanonicalGroupLimited.UbuntuonWindows_79rhkp1fndgsc\LocalState\rootfs\ . Create a site on Apache. To be able to access example.com:8080 from Windows you have to modify the hosts file located at C:\Windows\System32\drivers\etc\hosts. Append the following line to the end of a file. Add this snippet to the configuration file. Change /mnt/c/Miloslav/Projects to location where you have your projects. Before you run the website you'll need more PHP extensions in Linux. 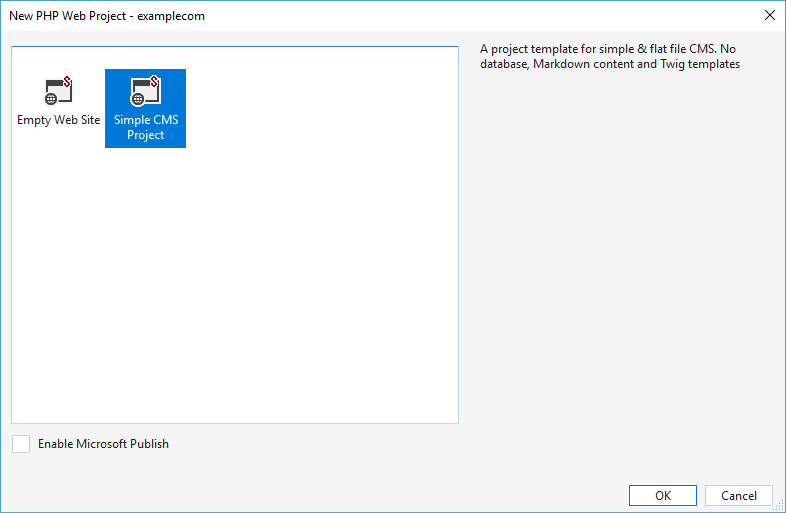 For our Simple CMS Project template, which is just slightly modified Pico CMS, you will need to install the following extensions. In Visual Studio your PHP Web Project has to be instructed about the web server setting in Ubuntu. 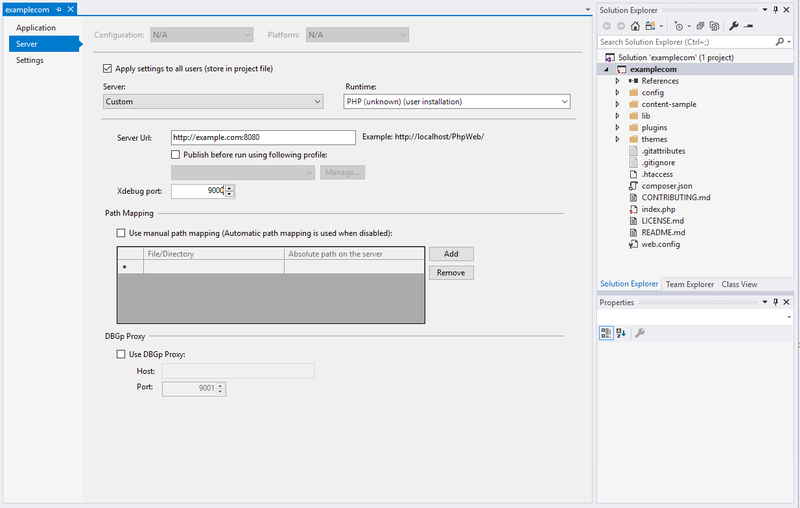 Just right click on project node in the Solution Explorer, click Properties. That's it. Now you can develop a PHP project in Visual Studio and run it on Apache on Ubuntu using Windows Subsystem for Linux. Let us know in the comments bellow if this tutorial helped or if there is any other other topic you would like us to see cover.